Soaring. 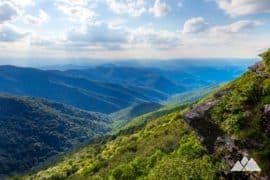 Or so it seems, standing on a lofty, windy mountain summit, gazing at birds of prey riding the breezy uplifts far below, and feeling decidedly on top of the world. 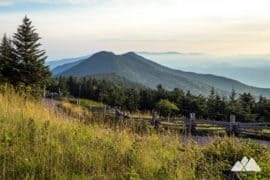 Though many peaks in western North Carolina lofty views, few offer the truly breathtaking drop-offs, sharp terrain and incredible 360-degree panoramas as Hawksbill Mountain. 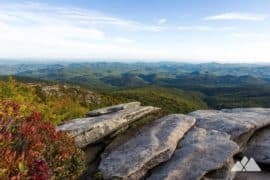 The craggy mountain rises from the angular, rugged terrain and steep-walled sides of North Carolina’s Linville Gorge, an 11,000-acre wonderland that has attained ultra-popularity with hikers, backpackers, climbers, and adventurers of all kinds. 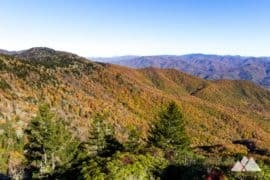 The mountain is perched on the gorge’s eastern rim, just north of the towering plateau-like Table Rock Mountain and south of the uniquely-named mountain named Gingercake. 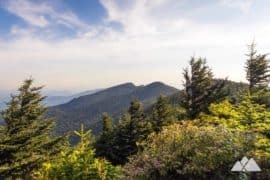 The hike to the mountain’s summit is a meandering adventure through a hardwood forest before a climb through a rocky, rhododendron-filled terrain. 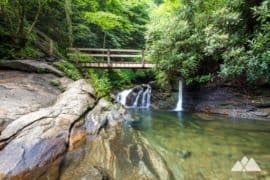 It’s a short hike, but a fantastic one, ending with view-packed panoramas from the mountain’s rugged, sharp rock outcrops that resemble a hawk’s bill in their high-altitude angularity. 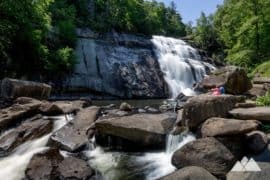 To the west of the summit, the Linville River cuts deep through its namesake gorge, tumbling and churning in tendrils of whitewater nearly 2,000 feet below. 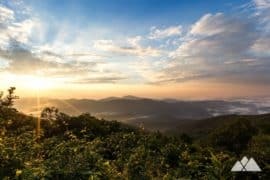 There’s nothing quite like catching an epic sunrise or sunset from the mountain. 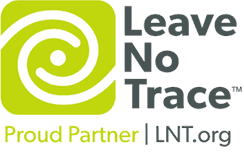 The trail is moderately easy to navigate, even in dwindling light, but be sure to pack a headlamp to help navigate the trail’s curves and switchbacks at dark. 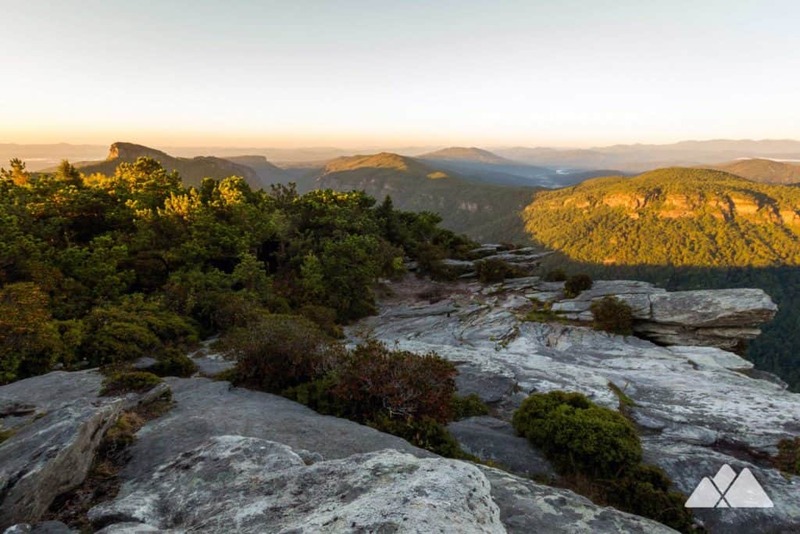 A quick scramble up to the summit for sunrise is one of our favorite ways to start a day of adventuring in Linville Gorge – and the sunrise views are often nothing short of spectacular. 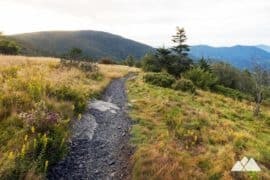 The hike begins at a trailhead off the gravel NC Forest Service 210 (view maps and driving directions), hiking southwest into a young hardwood forest with scattered pine. The trail meanders through a tight switchback at .2 mile, veering north. 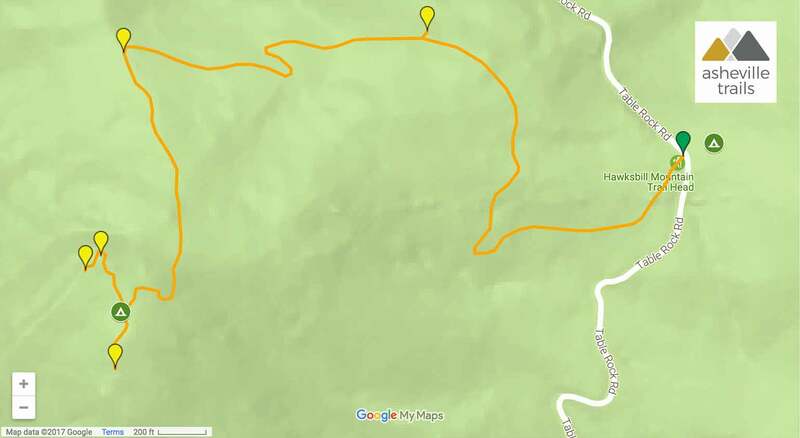 The hike passes a small, shallow cave at .3 mile and arcs westbound. 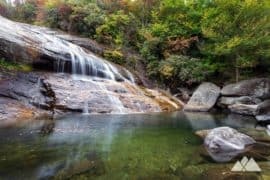 The trail ascends gradually, at least initially, as it winds through a rocky landscape peppered with moss and large lichen-crusted boulders. 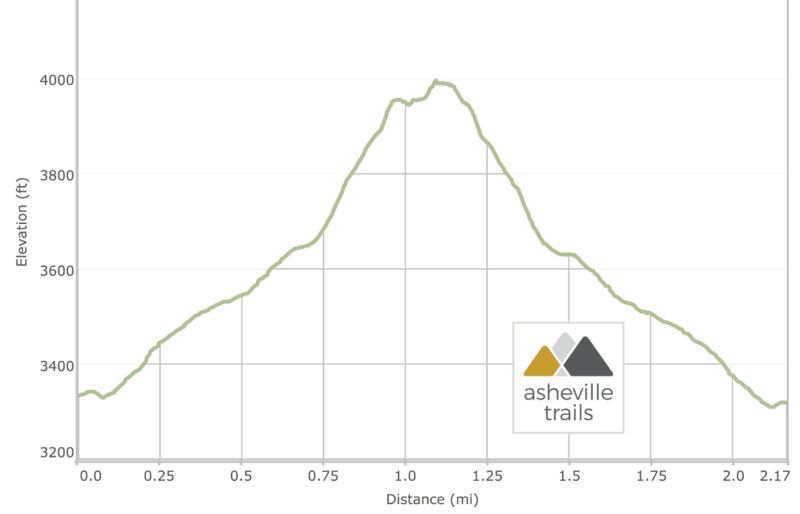 Gnarly-branched rhododendron and laurel dominate the forest as the trail climbs the mountain’s mid-elevations, passing a view off the trail’s right side at just under .5 miles. 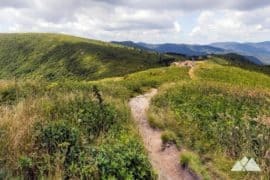 The trail carves through a series of tight switchbacks just before meeting a trail junction at .7 mile, and the hike turns left, following the signed direction to the summit. 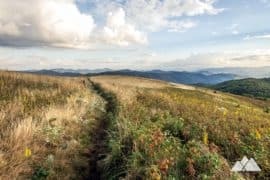 The hike becomes suddenly more strenuous as the terrain steepens and the trail makes a final southbound approach to the summit. 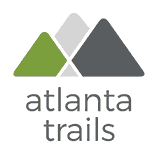 The trail summits Hawksbill Mountain at just under 1 mile, meeting the site of a large campsite. 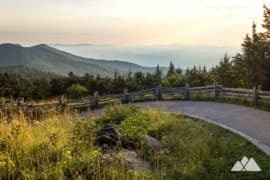 The trail splits here, turning left to hike southbound to stunning views of Table Rock Mountain, and turning right to hike northbound to the mountain’s best summit views from its angular northern peak. 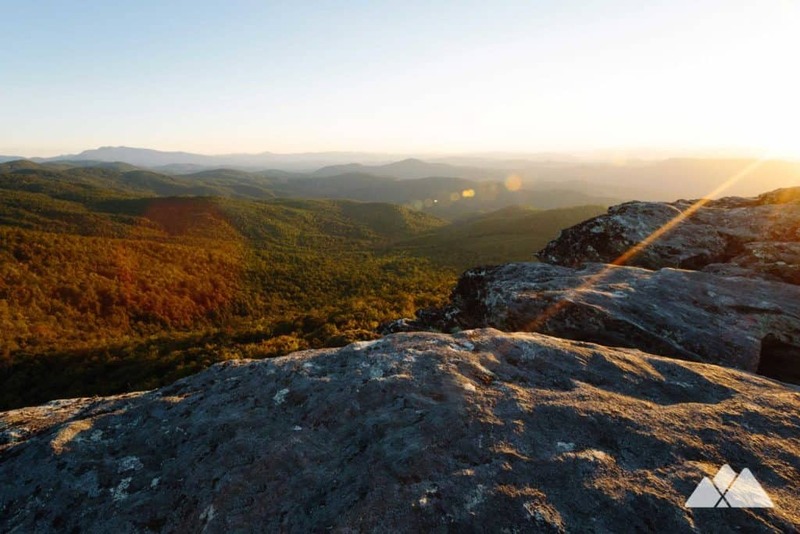 Views from the summit are simply spectacular, stretching far and wide into Linville Gorge and the surrounding forest. 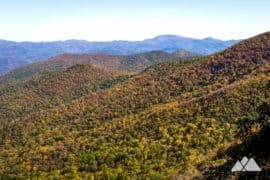 Shortoff Mountain dominates the southern horizon behind Table Rock, framing the nearby Lake James. 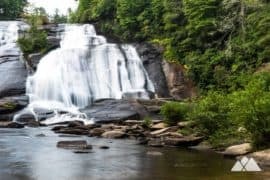 To the northeast, the far distant Linville Falls plummet through the entrance to the gorge, their thundering cascades audible from the mountaintop on a still day. 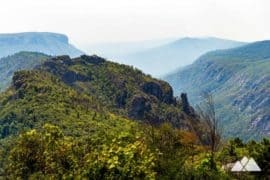 While there’s nothing better than catching a stunning sunrise from this rocky, angular mountaintop perch, foggy days can be fairly incredible as well, as wispy plumes of vapor roll through the gorge’s depths. 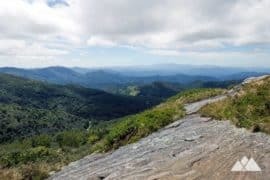 Departing the summit, the hike retraces its outbound steps to the trailhead, completing the hike at just over 2 miles. 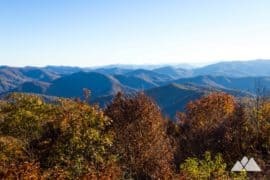 Ready for some more classic western NC beauty? 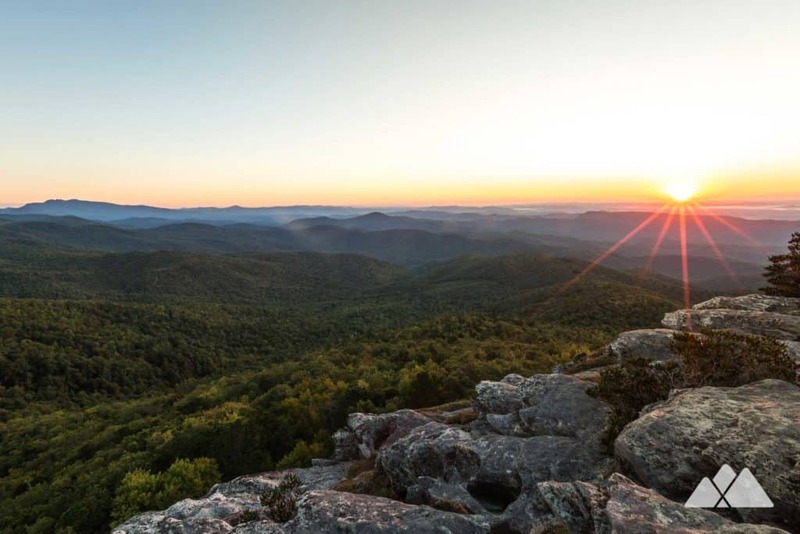 Don’t miss the towering summit of nearby Table Rock Mountain, a under-two-mile adventure with more outstanding views. 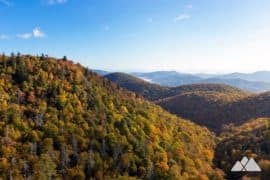 Or further south, hike the Shortoff Mountain Trail to catch stunning views through the length of Linville Gorge, and stunning views of Lake James from Shortoff’s rocky summit. 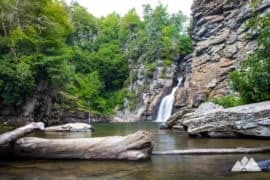 On the gorge’s western rim, hike the Linville Falls Trail to stunning views of the gorge’s gorgeous waterfalls. 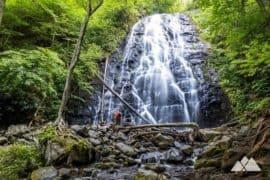 Or for an up-close view of the falls, plummet to the gorge’s floor on the Linville Falls Plunge Basin Trail, hiking to a beautiful, deep basin of water directly below the waterfall. 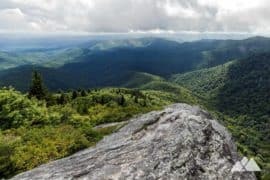 Or check out our Linville Gorge hiking and camping guide for more adventure ideas in this gorgeous, rugged wilderness. Free. 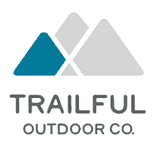 Trailhead access is via gravel Forest Service roads. 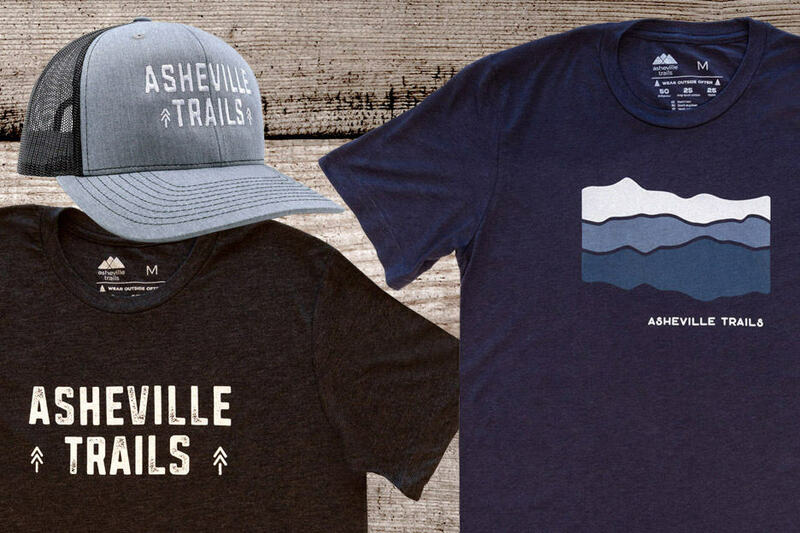 Love the trail? 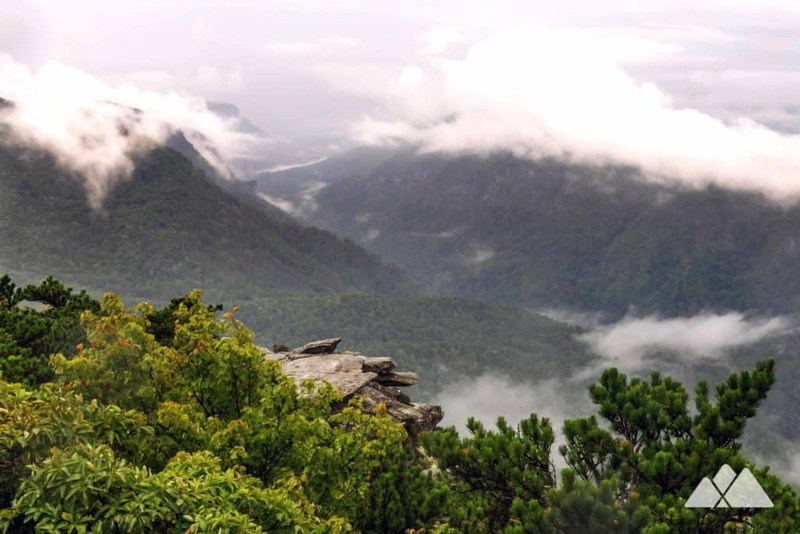 Please consider a donation to Southern Appalachian Wilderness Stewards to help support their outstanding work in the Linville Gorge Wilderness.